Fabulous location,Booking Spring and Summer 2019 now! Location is everything with this property. Not only are you less than two minutes from the beach and a large swimming pool, you are also walking distance from restaurants and shops of every kind. This unit is away from the street and on the second floor thus, very quiet. You are provided with beach towels, chairs and toys. 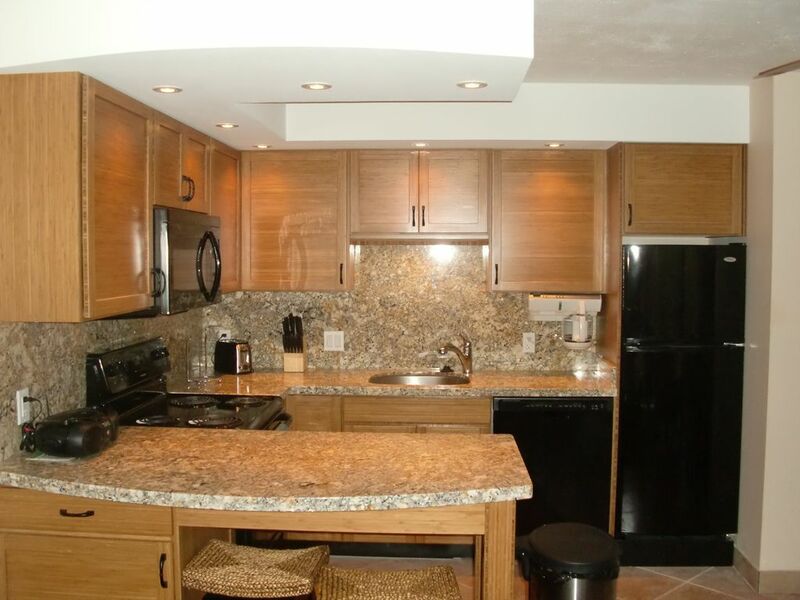 If you choose to dine in, the kitchen is fully equipped and ready for you to prepare for 4 people. The lanai is private and comfortable. When you decide to venture out you are minutes from the 'Shops at Wailea', a beautiful 2 story mall with many upscale stores. Golf courses are abundant, Maui Ocean Center Aquarium is nearby, and every water sport you can think of is available. If you are here in the 'high' season whale watching is a must do and if you don't want to go out on a boat all you have to do is walk across the street to view them! Gorgeous sunsets abound, aromatic trees are right outside your door and you will hear and see birds you've never seen before. Come enjoy this little piece of paradise, you won't regret it. Great location, walking distance to most everything. Location was excellent, grounds were well kept. We missed not having a hot tub for the evenings. The condo was clean. Nice to have a washer and dryer right in condo. It was a nice and quiet complex. Located close to the beach, shops and restaurants, we decided not to rent a car during our stay. We loved walking everywhere! Our young children (3yr and 5yr) loved being so close to the beach. The pool was a nice break and my 5 yr old loved meeting other kids by the pool. The condo had a varity of boogie boards, beach chairs, beach umbrellas, cooler, blow up pool toys, sand toys, beach towels and some old snorkel gear. This unit was well equipped for families. People were very friendly in the complex. The condo office staff were very helpful with suggestions and services. Quiet hours were nice and quiet for our sleeping kids. The complex has a place at the entrance for rinsing the sand off your feet. So handy! Kamaole III has grassy places for kids to run around and swings. We barbecued there a few times. There is an excellent kids beach with shallow water and no waves 3.3 miles away (across from kihei resort). My 3 and 5 yr olds could walk out to the breaker wall to see the turtles without being carried. There were turtles every time we went to that beach. Thank you very much for your review. Please let us know if we can assist you in the future. The property was very nice. Bill, the owner was very helpful to us, as we were first time traveler's. The location worked out very well as we were able to walk to the beach during the day and return to see the sunsets. We had easy access to Makena state park (big beach), the road to Hana and Haleakala summit plus other attractions. The condo had everything we needed including beach chairs, umbrella and boogie boards. Two large grocery stores were nearby. The staff in the office were extremely helpful and friendly. Thank you for the nice review! We're glad you enjoyed your stay and hope to accommodate you again in the future. Our stay in Kihei was wonderful! The grounds were well maintained and the condo is right next to the pool. The beach is across the street from the condo which was wonderful for easy beach days and sunset viewing. Also within walking distance of many bars/restaurants, general store, liquor store, and activity bookings. The condo has everything you could need for a comfortable stay including pool toys, beach umbrellas and chairs, cooler, kitchen utensils and tupperware. A few issues were that some lightbulbs were missing in the house and we couldn't get the living room TV to work (big deal, we were in MAUI!) The condo was very clean with plenty of linens as well as washer and dryer which was very convenient. This spot was perfect for our honeymoon and we would absolutely stay here again! My family of 4 spent 8 wonderful nights in this property over Christmas. This was our first time to Maui and we LOVED the location. With small kids, it was so nice walking across to a great beach and there are tons of good places to eat/drink near the condo. We also felt like the location was a good launching spot for access to the rest of the island. The condo itself was nicely appointed. There were a few signs of wear but overall it was in nice shape. The kitchen and living room were recently updated, granite countertops and just about everything we needed for cooking. We thoroughly enjoyed all the beach equipment available…numerous Tommy Bahama backpack beach chairs, 2 umbrellas, boogie boards for adults and kids, tons of sand toys, books galore and a cooler. Would I recommend this property – Yes. Would I stay here again – Already thinking about it!